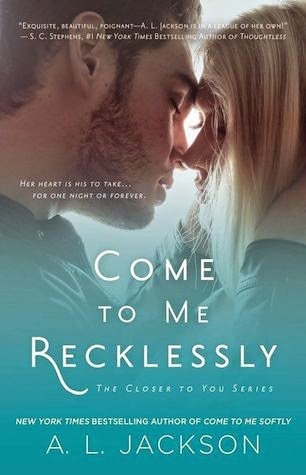 Come to Me Recklessly is the third book in the Closer to You series. This story encompassed the essence of second chances, heartbreak and unconditional love. Samantha and Christopher were each other’s first love. They intended to be each other’s first EVERYTHING but life, family and loss caused their demise. After years of rebuilding or more like surviving they find themselves face to face and forced to deal with all their unresolved issues. Christopher oh Christopher WHERE DO I START.... I KNEW he would be an incredible book boyfriend. Since he is Aly’s older brother we first met him in Come to Me Quietly. Almost instantly I ached for his story! Samantha has lived a sheltered life. Being the daughter of a Pastor, she has always felt the pressure of high expectations from her parents and their church. Samantha rebuilt her life and was able to follow her one dream, teaching. She convinces herself that she is “happy” but the reality is she was just content. "What does it take to delete the past? A thousand apologies? A million regrets? A litany of prayers? If I shouted them, would you hear? If I whispered them, would you believe? If I fell at your feet, would you forgive? If I asked, would you start again?" Christopher and Samantha were more than first loves - they are soul mates in every essence of the meaning. Oh they fought their connection and boy did they fireworks FLY! Come to me Recklessly is a heart-racing read.